Epoxy Flooring System installed in industrial warehouse. Ask about upgrades for faster drying times and more durability. For a consultation or estimate, contact us. High durability and stain resistant, epoxy floor coatings. A resinous flooring system for a range of budgets. Epoxy Flooring Systems may be designed to fit a range of projects and budgets. For light duty floors, epoxy floor coatings may be as thin as 20 mils. If you're looking for heavy duty usage, then applications may be applied up 1/2" or more. For more durability and faster drying times, ask about our MMA Flooring and Urethane solutions. 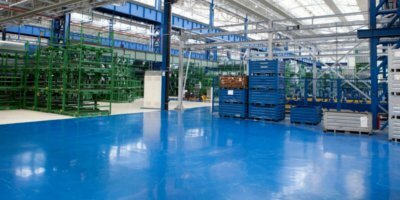 We've applied Epoxy, MMA (Methacrylate) and Urethane floor coating systems for the following facilities and more. Contact us for the best combination and system for your application. Make sure you meet and exceed your usage and industry's requirements. With informed and high standards, We can help you with that. We're certified and qualified epoxy and floor coating contractor for all major brands, including Dur-A-Flex, BASF Chemicals, Key Resin Company and more. Get started with a competitive, professional bid. Contact us for a consultation and free estimate.